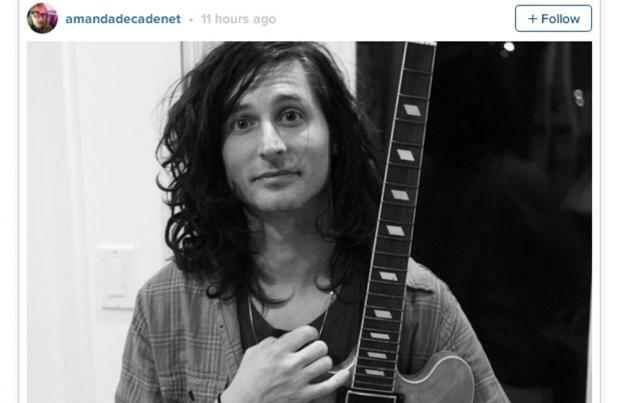 The Strokes' guitarist Nick Valensi has been reunited with his long lost guitar. The 'Last Nite' rockers launched an appeal with a reward of $5,000 (£3,500) last month anyone who could find the Epiphone guitar, after it was misplaced while being transported from New York City to Los Angeles. The rockers' appeal paid off as Nick's wife Amanda de Cadanet, has now posted a photograph of him with the 1995 Riviera model on her Instagram account confirming it's back in his hands, albeit "damaged" and without strings. Taking to the photo sharing app on Sunday night (21.02.16), she wrote: "Mr V got his beloved guitar back . Sadly it is severely water damaged, and covered in rust , with no strings. Just maybe it can survive after some TLC. Nick wanted to thank each and every one of you who helped hunt for his guitar. #StrokesFans really are the best !! #nickvalensi #guitar (sic)"
The band - also including Julian Casablancas, Albert Hammond, Jr., Nikolai Fraiture and Fabrizio Moretti - are yet to reveal how the precious instrument was found. The indie rockers first offered the sum of $1,000 (approximately £700) and then upped the reward after they got no leads.